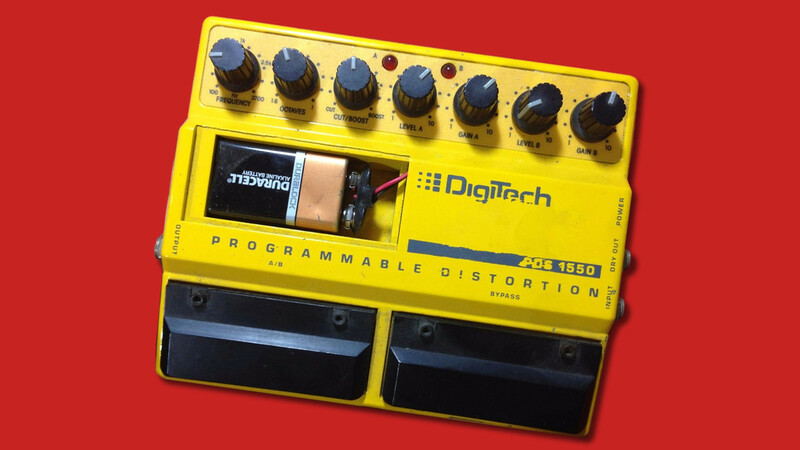 Posted January 4th, 2016 by Tom Wiltshire & filed under BBDs+Delays, Chorus, Flanger, Projects, Stompbox stuff. What’s a “compander”? It’s a simple way to make your circuit quieter! So how does it work? Let’s say we’ve got a fairly noisy effect, like a BBD. The basic idea is that you make quiet signals louder before you put them through the effect, and then you make them quiet again after the effect, and thereby make the noise quieter too. And that’s the clever bit! 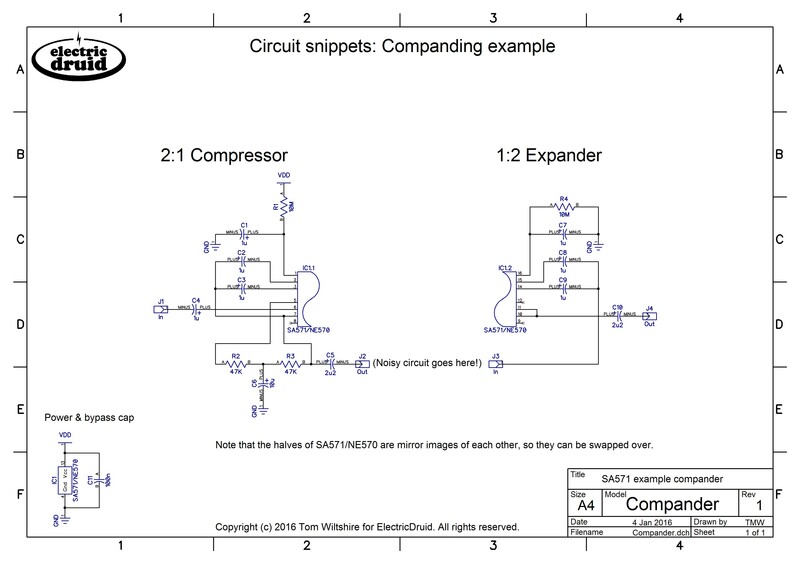 “Compander” is a compound of “Compressor” and “Expander”, since those are the two parts of that process. The compressor is the part that makes quiet signals louder (“compresses the dynamic range” in the jargon) and then the expander reverses the process and makes them quiet again (expands the dynamic range). Obviously it’s important that the two stages cancel each other out if we want the overall dynamics of the signal not to get mangled. The SA571 chip provides two sets of the building blocks you need to build compressors and expanders, so you can build a companding circuit with just one chip. 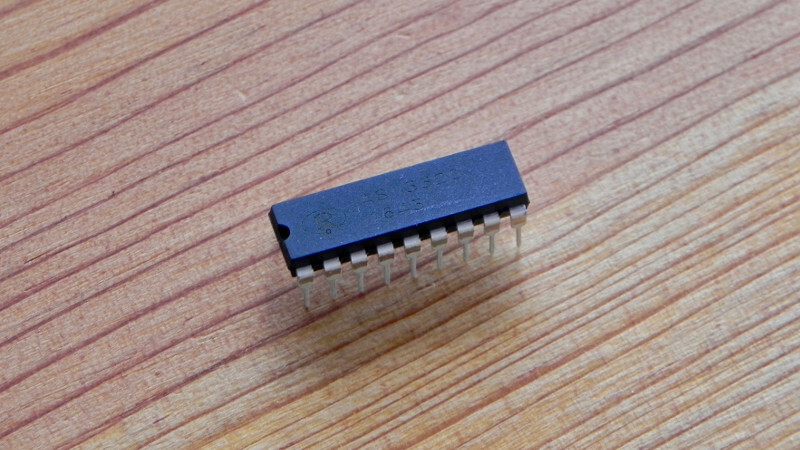 The two halves of the chip are identical copies of each other (apart from the power pins on pin 4 and pin 13, obviously) so you can use either half for either job. The technique is used in the PT-80 delay to reduce the noise added by the PT2399 delay chip. You can see on the PT-80 schematic the two halves of the SA571, one before the delay and the other after. The circuit values have been tweaked a little compared to my example above, but it’s otherwise identical. It’s useful in any BBD-based circuit to help reduce noise from the BBD. 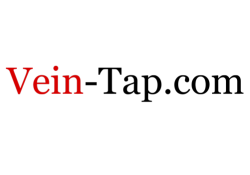 The process will help reduce both noise from the BBD itself, and also clock feedthrough. This can make for a quieter flanger, chorus, or analog delay. The compressor stage goes in front of the BBD pre-filter (the anti-aliasing filter), and the expander stage goes after the BBD post-filter (the reconstruction/clock filter). The diagram below shows the layout of a typical BBD-based pedal. This could be a delay, or it could be (with the optional LFO) a chorus or a flanger. They only differ in detail, not in structure. This diagram makes it quite clear why good quality analog delays or flanger circuits are so complicated! That’s a lot of stages! Still, they’re all there for a reason, and if you want to try and reduce noise, you probably need to add a compander. What does the ‘faster response and low ripple’ mean? The compressor/expander stages have to derive a signal representing the overall volume level from the input. This is usually done by rectifying and lowpass filtering the waveform with a fixed filter. If the lowpass filter’s cutoff frequency is too high, some of the original audio will still be present in the volume-level-signal (the “envelope”). This is “ripple”. If you reduce the cutoff frequency of the filter to remove the ripple, you can easily make the filter so severe that it cannot respond to quick transients and fast note attacks. The envelope response becomes slow. So there is always a trade-off between high cutoff/faster response and low cutoff/less ripple. No single solution fits all situations, and it is best to tweak a design for your intended purpose. what will happen when we change the value of the C6 capacitor? Probably nothing good! The purpose of C6 is to provide a path to ground for the AC signal. R2+R3 provide DC feedback around the output op-amp, but AC feedback is handled by the path from pin 7 back to pins 2 and 3. That path is AC coupled, so can’t affect the DC feedback. Is there a difference between an AGC (Automatic Gain Control) and a Compressor? Technically, I don’t know. Practically, no there isn’t much difference. It’s possible that an AGC would reduce peaks as well as boost quiet sounds, whereas a compressor only boosts quiet sounds (at least as far as I understand it). But I’m not certain. Certainly they use very similar techniques and technology, and the differences are only in how it is set up. I’m currently trying to figure out how the Expander side is biased correctly. The PT80 uses a 10k on pin 12, yet in your example it is disconnected. I’ve seen 8k2 been used in the compander cookbook and sometimes up to 20k. What does this resistance do? 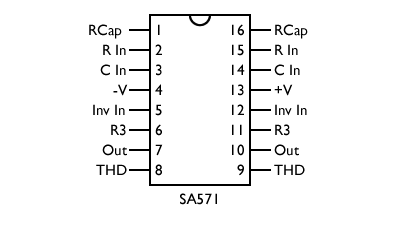 The other question is there are some SA571 with 15k/25k internal resistances R3/R4, how can those be biased? The stages are designed so that you can modify the internal resistance values by using external resistors in series or in parallel with them. In the expander case, it uses the internal resistances, and doesn’t need anything connected to pin 12. 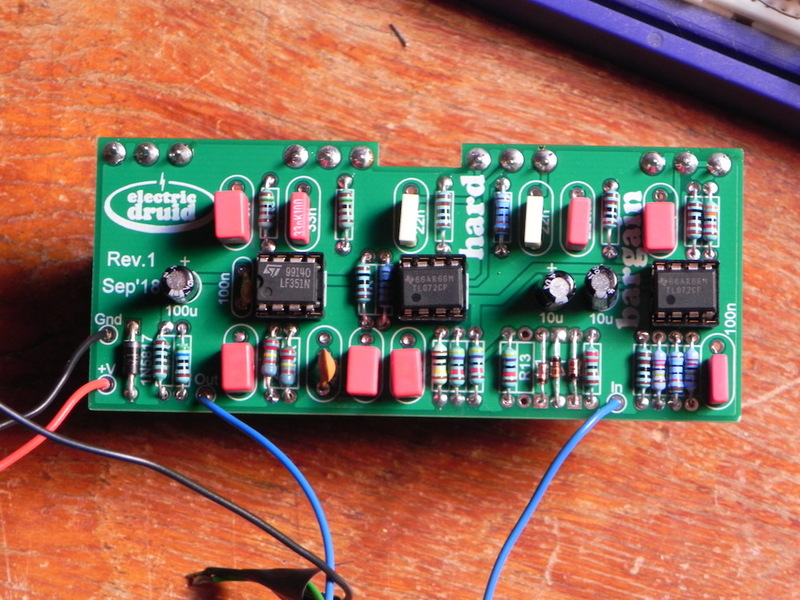 Notice pin 11 is connected to the output, to provide feedback around the op-amp. Firstly, 15k/25k isn’t very different as a ratio from 20k/30k (0.6 vs 0.6667) so it’s not a huge difference. Since you can adjust the R3/R4 values, you can fine-tune it in any case. The R3 value can be increased by adding a resistor in series on pin 6/11, and the R4 can be reduced by adding a resistor in parallel to ground from pin 5/12. That gives a lot of design freedom. The fundamental difference between a compressor and an AGC is that an AGC tries to keep the output level constant – if there is no input the gain rises to maximum until a signal appears then massive distortion until the gain is reduced to the right level as on most mono cassette tape recorders. The AGC will try to turn the background noise up as loud as the maximum signal level! A compressor adjusts the relative levels of the signal so no input say -80dB is compressed to -40dB, -60db to -30dB (assuming 2:1 compression). The expander does the exact opposite to the compressor so there is no noticeable difference in the original signal. If the sytem – tape recorder or delay line – has a S/N ratio of 50dB then the expander will expand that noise down to -100dB. Another way to look at it is that an AGC is a compressor with very high compression levels say 20:1 to 30:1. So could we say that the AGC is compression with a variable ratio? Furthermore, one where the ratio is inversely proportional to the signal level, so low signal = high compression ratio. Would that be a fair summary?